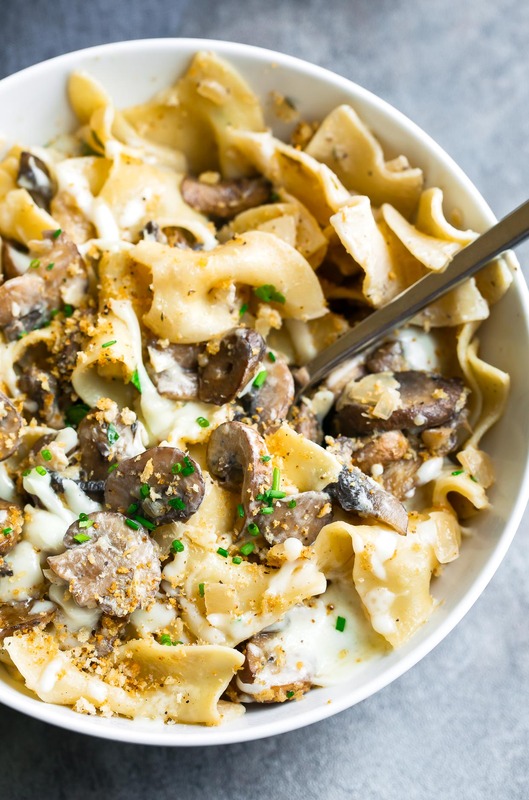 This vegetarian Mushroom Stroganoff features tender mushrooms and noodles in a creamy sauce. This easy recipe is perfect for busy weeknights and ready in under 30 minutes! Vegetarian comfort food, to be exact! Because we don’t need meat to curl up in cozy sweats with a piping hot bowl of yum! 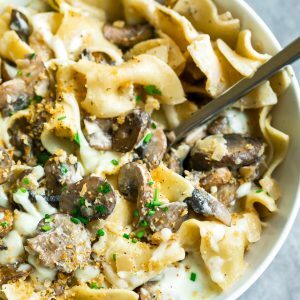 This dreamy, creamy mushroom stroganoff combines the luscious sauce and pasta stroganoff combo with hearty mushrooms in place of beef and doesn’t sacrifice flavor one bit! This comforting pasta dish is one of our favorites right now. We keep buying mushrooms on repeat to make it along with my go-t0 One-Pot Orzo Pasta with Garlic, Parmesan, and Mushrooms and Stuffed Mushroom Casserole. The mushroom love is real, yo! 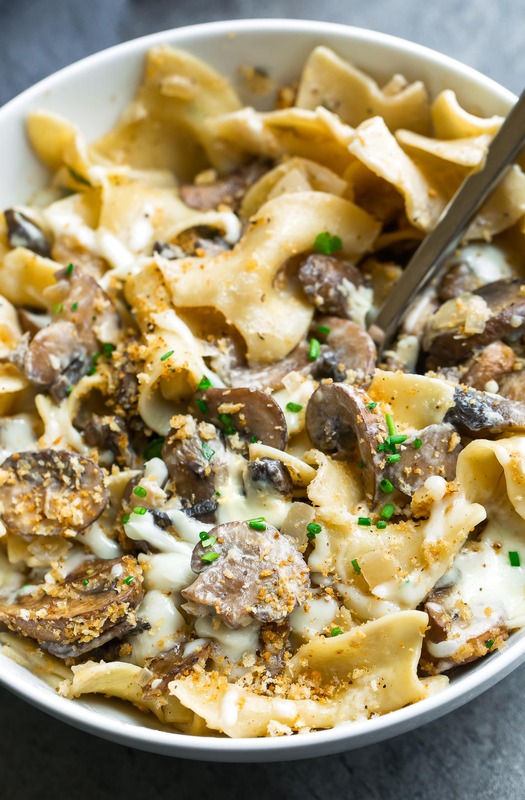 If you get a chance to try this creamy mushroom stroganoff, let me know! You can leave me a comment here (LOVE checking those daily!) or tag @PEASandCRAYONS on Instagram so I can happy dance over your creations. I can’t wait to see what you whip up! Get ready to rock Meatless Monday with this tasty dish! Bring a large pot of water to a boil and cook egg noodles according to package directions, approx. 8-10 minutes. While you wait, measure out all the ingredients above and start the veggies. This dish comes together crazy fast when you have everything ready to go! In a large pot or high-sided pan, heat a tablespoon of olive oil or butter over medium-high heat. Once it's hot, add the onion and cook for 4 minutes, then add your mushrooms. Sauté for an additional 4-5 minutes, or until mushrooms are browned and tender. Reduce heat to medium, then add the remaining oil/butter to the pan along with garlic and spices (thyme, salt, and pepper). Sauté garlic for about 30 seconds until fragrant. Add sherry/wine and soy sauce. Whisk together and, once hot, whisk in your flour. The mixture will start to clump and thicken, then you'll add your veggie broth and heavy cream. Stir it all up then fold in your pasta and sour cream. Garnish with chives (my favorite!) and any extras your heart desires. Dig in while it's hot! Stroganoff traditionally uses sour cream for the sauce's creaminess but we like to use a combination of both heavy cream and sour cream for the sauce. I've tried it a few ways and the above ratio is my family's favorite! Feel free to use mixed mushrooms here as well! Our local store sells a package of mixed wild mushrooms and this vegetarian mushroom stroganoff tastes great with a trio of cremini, shiitake, and oyster mushrooms. Nutrition Facts below are estimated using an online recipe nutrition calculator. Adjust as needed based on toppings/swaps and enjoy! Feel free to use a variety of mixed mushrooms here as well! Our local store sells a package of mixed wild mushrooms and this vegetarian mushroom stroganoff tastes great with a trio of cremini, shiitake, and oyster mushrooms. Looking for a gluten-free mushroom stroganoff? You can make this recipe GF with just a few easy swaps! Skip the optional breadcrumb topping, swap out the all-purpose flour for your favorite GF flour blend (I love this one) and snag yourself a package of gluten-free egg pasta! I like to add a little soy sauce for flavor (it adds a little somethin’ somethin’ to the dish!) but you could also add Worcestershire sauce in its place! There are vegetarian and non-vegetarian versions so just grab what applies. Chicken broth also works in place of veggie broth in a pinch if you’re not vegetarian and need a speedy swap. We don’t drink/use alcohol though….what could I substitute for the sherry/wine? I haven’t tried it yet, but apple cider vinegar is a common swap! Make sure you dilute it with an equal amount of water. In this case you would replace the 1/2 cup sherry with 1/4 cup apple cider vinegar and 1/4 cup water. This pasta looks so delicious! My husband isn’t a mushroom fan, so it looks like I’ll be needing to make this one night just for myself. No complaints here! Thank you Lauren! Hope you get to faceplant into a big bowl of this mushroom strognanoff super soon! Jenna this looks great!! Trying this stroganoff recipe super soon. This is the ultimate comfort food! No meat needed.